High Sierra's AT8 34" Wheeled Duffel Bag features a recessed, telescoping handle with soft gel-bottom handle, two side-loading water resistant compartment, and daisy chain webbing loops for attaching extra gear. 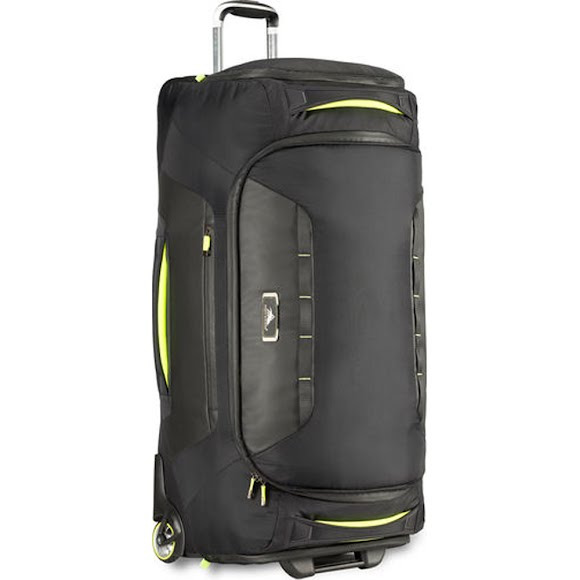 High Sierra&apos;s AT8 34" Wheeled Duffel Bag features a recessed, telescoping handle with soft gel-bottom handle, two side-loading water resistant compartment, and daisy chain webbing loops for attaching extra gear. Nylon is a high strength, durable material with excellent wear properties. The term "denier" (D) refers to the size of the yarn used: the larger the denier the bigger the yarn. Provides easy maneuverability when extended out from the case, and stores neatly inside when not in use. Locks in place in both the fully extended and stored positions for secure traveling. Dimensions 34.0" x 18.0" x 16.5"